Amalia and I met on Twitter, when @NazareaAndrews tipped us off to our mutual admiration of Thor. I clicked on Amalia’s website and I was hooked - come for Thor, stay for more? Good heavens, how had we not met before? Anyway, Sif had a son. Then she married Thor, making Sif, Thor, and Ull the original blended family. Ull grew up to be the Norse God of Winter. He was renowned for his athletic abilities, and he pulled extra duties as the God of Archery, Hunting, and Skiing. Mythologically speaking he may have married Skadi, the jotun/goddess associated with skiing and winter. And considering the number of sites throughout Scandinavia bearing his name, he must have been a pretty major diety at one point. But scholastically speaking, Ull was a pretty blank page. And that made him the perfect casting choice for the god who steals the heart of Elsker’s small town protagonist, Kristia Tostenson. I had an epic time creating my Ull. I knew he was a hunter, so I gave him a day job as an Asgardian Assassin. I knew he was God of Winter, so I let him enroll in Midgard’s (Earth’s) graduate schools to study climate change and environmental sciences. After all, global warming would wreak havoc on the God of Winter’s job security. But most importantly, I knew he’d lost his father at some point in his life, so I gave him some serious insecurities. When Ull meets Kristia, he’s absolutely terrified. He’s seen a lot of loss in his life, and knows the Norse apocalypse (Ragnarok) is around the corner. Ull can’t fathom dragging someone he could potentially love into the middle of the battle between good and evil, any more than he can fathom someone choosing to spend their life with a trained killer. But there’s more to Kristia than meets the eye, and she’s determined to show Ull that he deserves her love. Because sometimes fulfilling your destiny means doing the exact opposite of what The Fates have in store. Thanks so much for hosting me Amalia, and happy Tyr’s dag -- Tuesday! 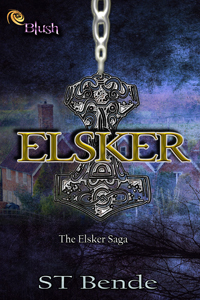 You can learn more about Elsker over at Entranced Publishing, add it on goodreads, and be sure to check out the fantastic, Thor-Lovin' S.T. Bende on twitter, facebook, and her blog! Thanks so much for hosting me Amalia! I have mad #ThorLove for your blog! So glad to have you!! It's always fun to find another devotee of the Thor Love! Wow, that look intriguing. I'll put it on my TBR list.